Boxing focus pads training is one of the best ways to improve your boxing attributes, but it does require a partner to hold the focus pads for you. This type of training is a must for pretty much every competing boxer and fortunately these boxers usually have a trainer/coach or someone who will know how to hold the pads. For those who don’t compete but likes the idea of boxing pads training, you’ll need to ensure you have someone to hold the pads who know what they’re doing or pay for a personal trainer who has the right skillset. If you have some boxing experience then you’ll know that having a pad man with no experience is very frustrating. Holding them with the correct technique to prevent injury to yourself or the boxer. Understanding all the types of punches and what combinations to call out. Adjusting to the boxer’s style. 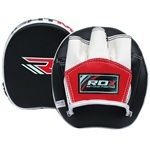 Being able to hold pads for orthodox or southpaw boxers. 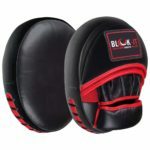 Some of the skills mentioned above wouldn’t be necessary if the person punching the pads has minimal boxing experience as the workout will also be basic starting off. However if the boxer is experienced and you really want to give them a good workout then the above attributes are required. 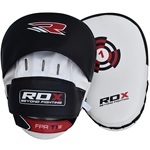 Choosing the best boxing pads is not as difficult as choosing the right pad man, but making sure you have the best focus pads is one thing you have control over. By knowing what features to look out for, you’re more likely to pick the right pair. Material – Certain types of material such as leather will be more durable and will also probably last longer. You might also feel it connects with the gloves better. Cheap materials don’t tend to last as long and you won’t hear as much of an impact when you punch it. Wrist strap closure – Having a wrist strap is meant to help lock your hands into the pads so the pads won’t come off as easy. This however can be down to personal preference, the wrist strap might actually annoy some pad holders and they can have more control without a wrist strap. Flat/curved – This refers to the shape of the front of the pads, it can either be flat or curved. 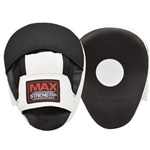 Again, your choice might be down to personal preference, but curved boxing pads tend to catch the punches better as the curved shape fits nicely around boxing gloves. Open finger design – Open finger design pads will allow your fingers to breathe a bit more, so sweat doesn’t build up as easily. Closed designs do usually have holes for ventilation but it does still get sweaty inside which might start to smell after a few months of using it. Length & width – The length and width of the pad is essentially the target area. Most pads will have a circle in the centre as this is the target you should focus on punching, furthermore if the area is bigger it’ll be easier to hit the target. 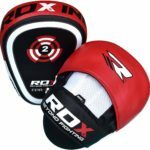 Beginners should be practicing on pads with a big enough target area, whereas more experienced boxers might prefer punching a smaller target as this can help improve your accuracy more. Thickness – Thicker pads absorb more of the impact of the punches so the pad holder won’t feel it as much and the pads will probably also have a longer lifespan. Nevertheless it’s still having the correct technique that’ll ultimately reduce the impact of the punch and prevent injury. Mixing up the different types of boxing training is one of the best ways to develop and improve your skills. But we’ll break down what’s good and what’s not so good about pads training and training on the heavy bag or freestanding heavy bag. This way you can concentrate more on a specific type of training, but like we said you should still mix things up. Improves your overall skills and attributes more, such as: Accuracy, co-ordination, speed, power and balance. You have to train at the pace set by your pads holder. Equipment required works out to be cheaper. This type of training can be done anywhere. Can work on all types of punches unlike with punch bags, you’re unable to throw uppercuts unless it’s an uppercut punch bag. Requires you to find a good trainer/partner who knows what they’re doing. If you have an inexperienced trainer then it’ll end up causing you more frustration. Does not require a partner to train with. Good for working on combinations and power. Allows you to work at your own pace if you want to work on something like a specific punch. Easier to develop bad habits. You can take it easy if you get out of breath, so it doesn’t encourage you to train as hard. Equipment required works out to be more expensive. Only able to train if you have a punch bag at home or at a gym with a punch bag.